Sunday’s Ronde van Vlaanderen voor Vrouwen - the Tour of Flanders for women - will be the tenth edition of what is, arguably, the biggest one-day race in the women’s calendar, and should prove as dramatic and exciting as the previous nine. The race is run over a similar course as the men’s race - albeit over just less than half the distance at 127.4km - and uses the same finish. Last year’s edition saw Judith Arndt (Orica-AIS) and Kristin Armstrong (United States) escape the field on the climb of the Oude Kwaremont with just over 25km to go, then open up a lead on the Paterberg and Hoogberg/Hotond climbs that followed. Although there were still 16km to race after the final climb, as the World’s two best time triallists, they managed to hold off the chasing peloton for Arndt to repeat her 2008 victory. In the absence of Arndt - who retired after the successful defence of her World time trial title - the honour of the number one dossard has been given to World Cup leader Marianne Vos (Rabobank-Liv/Giant). The Ronde van Vlaanderen is virtually the only major race missing from the World and Olympic champion’s extraordinary palmares, and this is the one that she really wants to win. Vos will be the overwhelming favourite - as she is in virtually every other race - and will have one of the strongest teams behind her, including 2011 Ronde winner Annemiek van Vleuten. That day van Vleuten was able to get away in the final kilometres - along with Russian champion Tatiana Antoshina - as the rest of the big names watched Vos. Their opponents will not want to let this happen again, but the two Dutchwomen will doubtless play their two-pronged tactic as usual. Vos could only manage sixth in last weekend’s Trofeo Alfredo Binda, after some of the other teams - including Orica-AIS - put pressure on Rabobank early on, and forced the World champion to use her teammates early. This could be the only way for the rest of the peloton to stop her on Sunday. 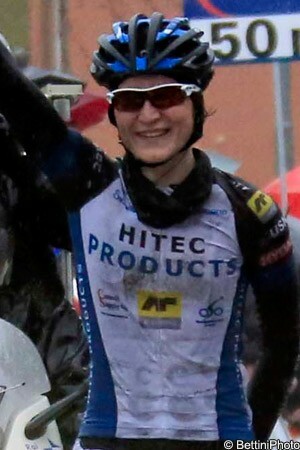 Vos’ biggest rival could be the Binda winner, Elisa Longo Borghini (Hitec Products, pictured), who - following her imperious victory in the pouring Italian rain - is brimming with confidence coming into Flanders. The 21-year-old would have been one of those to watch anyway but, after her result this week, the peloton will not want to let her out it its sight. Emma Johansson (Orica-AIS) is another rider that really wants this race, as she makes her home in the area during the racing season. The Swedish champion ended her five-race run of third places with a victory in the GP Cholet two weeks ago, and was second behind former teammate Longo Borghini in the Trofeo Binda. Having moved to the powerful Orica-AIS team this season, which has dictated much of the early season racing, this could be Johansson’s best chance. The Specialized-lululemon team has lost two of its most likely riders to injuries in recent weeks - with Ina Teutenberg suffering a concussion in the Drentse 8, and Evie Stevens suffering facial injuries in the GP Città di Padova - but has looked no less powerful in the World Cup so far. Dutch powerhouse Ellen van Dijk has stepped up to the plate with second place in Drenthe behind Vos, and surprising herself with third in Binda; ironically, the Flanders course suits her even better. With such a long distance from the top of the final climb to the finish a sprint is highly likely to happen, especially as the 16km run in makes up more than 12.5% of the course. In this event Vos will still be a hot favourite - with Johansson also likely to feature - but the rider to watch will be another Dutchwoman in the shape of Kirsten Wild (Argos-Shimano). Wild has shaken off the track legs she developed for last year’s Olympics and has already taken five victories this season, including three stages and the overall of the Tour of Qatar, and - perhaps more significantly - last week’s Gent-Wevelgem. Other names to watch out for on Sunday include British Olympic silver medallist Lizzie Armitstead (Boels-Dolmans), along with Dutch teammates Adrie Visser and Martine Bras, former Italian champion Noemi Cantele (Be Pink), and Johansson’s Orica-AIS teammates Tiffany Cromwell and Loes Gunnewijk. With 2011’s Grace Verbeke missing from the CyclelivePlus-Zannata team, van Vleuten will be the only former winner lining up at the start on Sunday. Representing the home nation will be Rabobank-Liv/GIant teammate Liesbet De Vocht, the ever aggressive Maaike Polspoel (Sengers), Jessie Daams (Boels-Dolmans), and Belgian champion Jolien D’hoore (Lotto-Belisol).